Solar System: Mercury. Creation Testifies! Mercury is the smallest planet in our solar system. Mercury's diameter is only 38 percent the size of Earth, making it the smallest and least massive of the eight planets. Mercury is the innermost planet of our solar system, orbiting the Sun at a distance of only 36 million miles. Mercury is nearly three times closer to the Sun than Earth is. Mercury is a solid, rocky world, with only a trace of an atmosphere. Mercury has mountains, valleys, plains and craters. Since it is closest to the Sun, Mercury has the shortest "year" of any planet. Mercury takes only 88 Earth days to complete one orbit. Every time Earth completes one orbit, Mercury has already made four trips around the Sun. Mercury has the longest solar day of any planet. Since Mercury is three times closer to the Sun than Earth and has no substantial atmosphere to transport heat, the surface of Mercury can reach 800 degrees Fahrenheit! This is more than enough to melt lead. The temperature on the night side of Mercury can drop to -280 degrees Fahrenheit. This is because it is in continual darkness for up to 88 days and there is no significant atmosphere to prevent the night time surface from radiating virtually all of its heat into space. 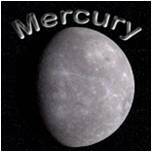 Mercury turns on its axis three times every time it orbits the Sun twice. Mercury is only visible at twilight and at certain times of the year. In 1974 NASA sent the Mariner 10 spacecraft to visit Mercury. Mariner 10 measured a substantial magnetic field for this tiny planet. This is disturbing news for secular scientists who believe that our solar system is billions of years old. A small planet like Mercury should not be able to maintain a magnetic field for so long! Creation Testifies! is a Ministry of Rogersville Baptist Temple. Content © 2011- Creation Testifies!